Members of the Network work synergistically to strengthen, expand and diversify their programs to offer the highest quality of services to those we are privileged to support. Family Residences and Essential Enterprises, Inc. (FREE) collaborates with a variety of diverse 501(c)(3) nonprofit partners on educational, vocational, rehabilitative and a myriad of other creative initiatives to enhance the local communities and the lives of those that reside within them. Each of the valued partners of the FREE Network have a unique mission, vision and strategic goals that are aligned in purpose, and embody the spirit of the meaningful work we do every day. Each partner has identified their own path to achieving strategic objectives and countless individualized possibilities have been co-created for those we support. Family Residences and Essential Enterprises, Inc. (FREE), founded in 1977, benefits and proudly supports more than 4,000 individuals with intellectual/developmental disabilities, mental illness and traumatic brain injury. It is the mission of FREE to assist individuals of all abilities realize their full potential. 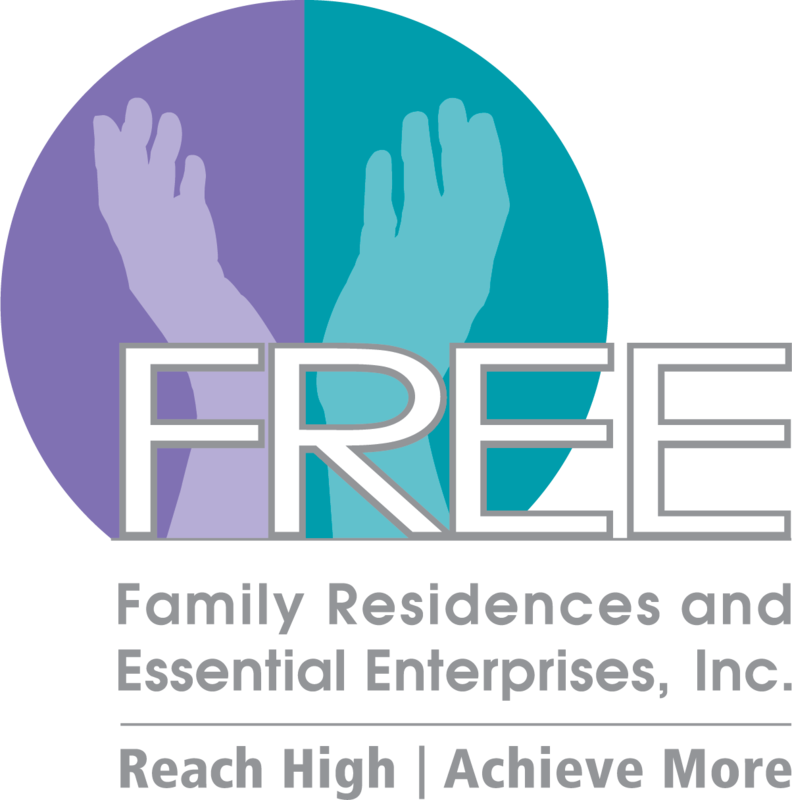 FREE provides a diverse array of supports and services including: housing; recovery services; transition to work; employment; day, community and family services; respite; crisis services; education and after school support; specialty health services; and advocacy. Homes Anew I, Inc. & Homes Anew II, Inc. Provides individuals that are differently-abled and/or homeless, or at risk for being homeless, with transitional and permanent housing opportunities and support services funded by the U.S. Department of Housing and Urban Development (HUD), and Homeless Housing and Assistance Corporation (HHAC). For more than 50 years, The Rehabilitation Institute (TRI) has assisted individuals that are differently-abled in reaching their highest level of independence through the provision of employment, educational and therapeutic services. These services are designed to assist an individual in identifying personal and professional goals including: vocational assessment, counseling, training, remediation, day habilitation, production and support services (i.e., socialization skills training, travel training, remediation, etc.). Working directly within the community, TRI’s job placement department develops internships and jobs, job coaching and follow along services to assist individuals in securing and maintaining employment. The mission of the National Foundation for Human Potential is to promote, develop and encourage educational and support services for children and adults that are differently-abled, and/or at-risk youth, through financial and other means of support. To meet that purpose, the Foundation raises funds and provides contributions and grant awards to organizations which build communities. The purpose of Adelante of Suffolk County, Inc. is to serve the diverse people of local communities through a broad range of programs that improve and inspire forward movement in the lives of families, senior citizens, youth and people of all abilities. Adelante is able to accomplish this by providing supported housing and case management, family and youth services, housing and tenant counseling services, nutrition programs for the elderly, educational and career counseling, youth leadership, after-school programs, Medicaid service coordination programs, among other resources. Skills Unlimited, Inc. offers a full range of rehabilitation services to persons with disabilities. Programs are specifically designed to foster independence, which is accomplished through comprehensive planning with the individual as an active participant. Ancillary services are also offered to enhance the opportunity to succeed. Skills Unlimited, Inc. has implemented many services to effectively help individuals, including vocational training programs, pre-employment counseling, an outpatient mental health clinic, supported employment, day habilitation, professional evaluations and other exceptional amenities. Pronto of Long Island, Inc. is an outreach center whose mission is to feed the hungry, clothe the needy, welcome the stranger, and provide healing and hope to everyone who walks through their doors. Pronto opened in 1969 from the vision of a group of committed lay people and clergy at St. Anne’s Roman Catholic Church. Since then, it has gone through several reincarnations, resulting in a unique partnership with Catholic Charities to house the central FAN (Food and Nutrition) site for Long Island. Pronto has been able to flourish based on contributions of clothing, furniture, household items and monetary donations. As always, this vision is fueled by prayer and the hard work of committed volunteers, and with these two powerful elements, Pronto cannot help but succeed.